If you’ve seen the German series Babylon Berlin, which debuted on Netflix last month, you know that the final two episodes are a wild, completely unpredictable journey. The show is a massive urban adventure set in late-1920s Berlin, full of so many twists and reversals that by the time you get to the end, you can barely remember all the big moments that shocked you. Part noir, part spy thriller, part historical portrait, Babylon Berlin’s characters are striking enough that you’re happy to follow along, even when you’re not super clear on what exactly is happening. 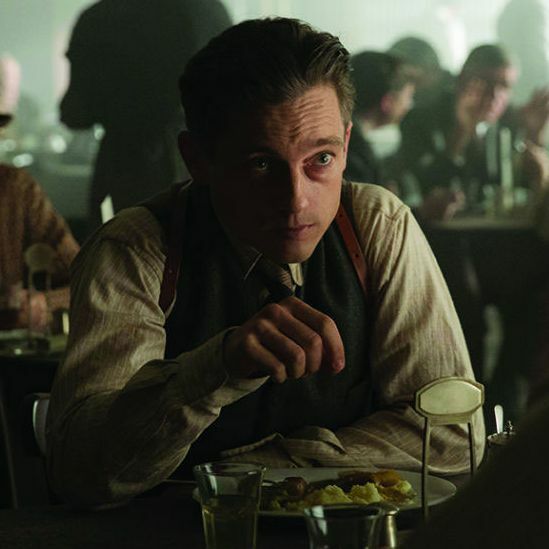 Series co-creators Tom Tykwer, Henk Handloegten, and Achim von Borries are currently writing another season, but for now, here’s a rundown of what happens at the end of Babylon Berlin and a few questions about how it got there. What’s the deal with the train? Babylon Berlin’s central MacGuffin is a mysterious train that seems at various points to be carrying gold, poison gas, or both. It is in the possession of, or sought by, most characters at one point or another. The full picture looks something like this: The train comes from the Soviet Union into Germany, and it is carrying both a gold fortune from the wealthy Russian Sorokina family and enough phosgene gas to kill all of Berlin. Except in the finale, we learn the gold isn’t real! It’s just coal painted to look like gold! The whole fortune was fake! But then, we discover the gold is the train itself, which Gereon and Charlotte figure out by studying clues from a painting of the Sorokina family. Where is the train going? Who tries to stop it? Wait, which ones are the Black Reichswehr? They’re the group of German nationalist proto-Nazis, lead by General Seegers and industrialist Alfred Nyssen. In violation of the post-WWI Treaty of Versailles, they’ve been secretly building a powerful German air force at a base in the Soviet Union, and their goal is to take down the Weimar Republic and restore the German monarchy. Near the end of the season, we learn that Gereon’s partner Bruno Wolter is a secret member! Who is the Countess, exactly? How did the Armenian find the train? This goes back to events before the finale, when the Armenian kidnaps Charlotte and locks her in a freezer. While ice crystals slowly form around her eyes, Charlotte is able to decipher her murdered partner’s notebook and discovers the existence of the gold, the real identification of the train car where it’s located (because the Reichswehr switched the train car ID), and the location where the Black Reichswehr intend to halt the train and take it over. All of that is in the notebook because Stefan was assigned to spy on his boss, secret Black Reichswehr member Bruno Wolter. Hold on, Fritz is alive?! Ah yes, Fritz. In the end of the second-to-last episode, housemaid Greta puts a bomb in Councilor Benda’s desk as an act of revenge. As far as Greta knows, her boyfriend Fritz — a prominent member of one of the German Socialist parties — was shot by the Berlin political police. One of Fritz’s friends even shows her an arrest warrant out in Fritz’s name, approved by her boss to help convince Greta that Benda is at fault. In the last episode, a shell-shocked and guilty Greta runs away to a train station and sees a group of pro-nationalist German soldiers who’ve formed an angry mob at the station. There, among the group of shouting soldiers, is Fritz — alive! But her supposedly dead Socialist boyfriend is now wearing a Reichswehr uniform rather than a Socialist pageboy cap. Though the guy pretends not to know her, we realize that Fritz’s death was staged to give Greta the incentive to kill her employer. Which group convinced Greta to kill Benda? Babylon Berlin isn’t very clear on whether Fritz was a Reichswehr member undercover as a Socialist the whole time, or if he’s now a Socialist in an army uniform. Because of that, it’s hard to say whether the Socialists are the ones who organized the hit on Benda (and his daughter), or whether the hit came from somewhere within the Reich. It doesn’t particularly matter: Benda was a needle in everyone’s side, and his Judaism made him loathsome to the rising Nazi forces inside the Reich. He was in trouble no matter what. Hooray! While on their way to stop the gold train, Gereon and Charlotte are driven off the road by Wolter, who’s also on his way to stop the gold train. Although she appears to drown, Gereon somehow pulls her from the wreckage of their submerged vehicle and revives her. And then she gets to be an official member of the police department! It is the most straightforward, easy-to-follow thing that happens at the end of Babylon Berlin, and it would feel like a happy ending for her except … oh, right, it’s the early 1930s in Germany. What side does Gereon end up on? You’d hope that our hero would go down fighting the good fight in support of the doomed Weimar Republic. After all, he worked closely with Benda and risked his life to fly a rickety plane all the way to the Soviet Union to gather evidence that the Black Reichswehr was violating of the Treaty of Versailles. But the finale suggests he may be an opportunist after all: In the end, he gives false testimony about the events that caused the death of two innocent women, in order to protect the police. (He’s also almost killed by the Socialists for lying during his testimony.) Just as troubling, his new boss puts him in charge of a secret commission to spy on the political leanings of everyone in the police department. And his new boss is absolutely a Nazi. Who is this mysterious hypnotist? This is the biggest surprise of the finale, and that status means more on Babylon Berlin than almost any other series. All season, we’ve been haunted with bits and pieces from a mysterious, scar-faced hypnotist, Dr. Schmidt, who claims to be able to cure PTSD through “suggestive therapies.” He’s connected to the Armenian, and he runs a hospital full of men suffering from war wounds both mental and physical. In the very final scenes, Gereon is kidnapped (in the middle of an assassination attempt by the Socialists! ), and taken to Schmidt, who hypnotizes him and leads him back through the war flashback we’ve seen throughout the series. In it, Gereon sees his wounded brother Anno out in no man’s land. But rather than run out to try save him, as the flashback has previously shown us, we learn that Gereon actually abandoned his brother to die. But actually … Anno didn’t die! He was the hypnotist Dr. Schmidt the whole time! If we do get another season of Babylon Berlin, it seems that Gereon will be caught between the Nazi inclinations of his new boss, Charlotte’s social-justice derring-do, and the thus far mysterious agenda of his hypnotist brother. It’s hard to imagine anything could top these last two episodes, but I’m certainly eager to watch Babylon Berlin try.